Hong Kong is a ultra dynamic city that never sleeps and staying in location that offers quick access to the train and basic things such as restaurants, convenience stores and a like can be easy so long as you stay within the city centers like Kowloon. However, getting clean and decent rooms can be challenging specially with so many competing hostels that there is. After searching over and over the internet for the best and affordable place that there is, review after review we ended up booking Dragon Hostel and yes with no regrets. Dragon Hostel sits at the heart of Kowloon just a block off from the nearest MTR station. Convenience stores and restuarants are within reach and the neighborhood it sits in offers affordable basic commodities. The building has four elevators two on each side servicing just fifteen floors. Though the elevators, since they are smaller than standard once can be a bit crowded at times it can be a lot more forgiving than the Chung King Mansions -which we suggest should be your last resort. Dragon Hostel offer rates that are reasonable, I tell you if you get prices lower than what they offer better think twice of how decent they are. Overall, our experice with Dragon Hostel was excellent the wifi was fast -like really fast, the beds and the room and the bathroom were clean and no bugs! 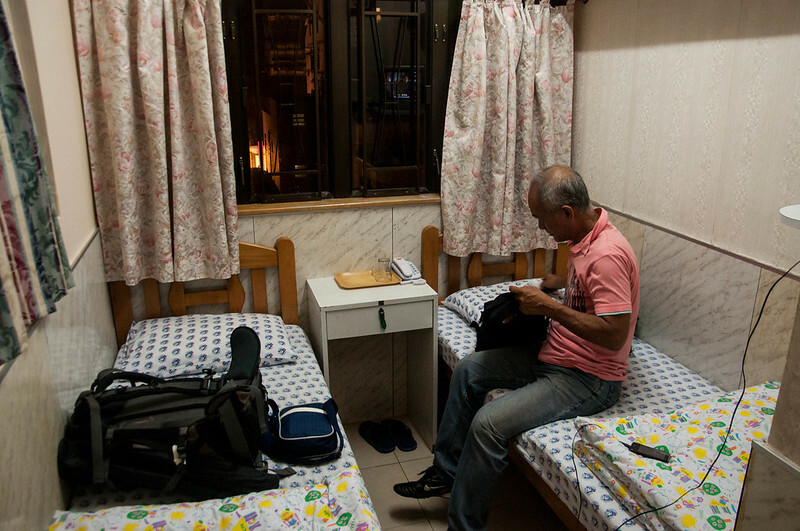 The rooms a bit small specially for westerners but that is just how the roll with Hostels in Hong Kong. What made our stay extra special was being at the heart of the action where all those haggling and bartering happen. Like they say there Hong Kong has two faces – Central and Kowloon, and Kowloon is the face of Hong Kong that I love. Elevator sometimes gets too busy going down, but there are four of them so just be patient and it is better than what Chung King Mansion has. You can also buy your tickets for amusement parks at the reception at a discounted rate!